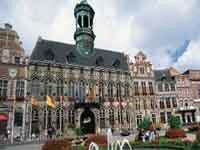 Arlon is one of the oldest cities in Belgium, located in the south-east of the country. It is located at 30 km from Luxembourg and at 190 km from Brussels. Here, in 2005, the IKEA store was opened.